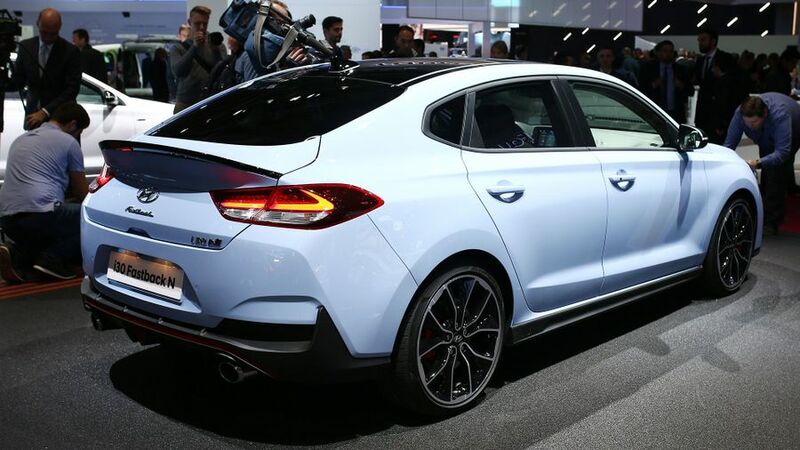 Hyundai has taken the wraps off the five-door coupe version of the high-performance i30N, which it will call (rather awkwardly) the i30 Fastback N.
Many of the design touches will be familiar from the i30N hatchback, but the redesigned back end features a unique rear bumper including triangular-shaped rear foglamps and a glossy black rear spoiler. That new rear end also results in a modest 55-litre boost in luggage capacity over the i30N hatchback, giving you up to 450 litres. Unlike the i30N hatchback, which is available with either 250 or 275 horsepower, the Fastback will only be offered in the more powerful form. That means 0-62mph in 6.1 seconds and a top speed of 155mph. If you care, the claimed efficiency figures stand at 36.2mpg and 178g/km (under WLTP test procedure and converted to NEDC, for some reason!). All the performance enhancing gadgetry found in the i30N hatchback is also present an correct, including an electronically controlled limited slip differential, automatic rev matching function, a variable exhaust note and an adaptive suspension, all of which can be controlled through the car’s various driving modes. Prices for the i30 Fastback N are yet to be announced by the car should be on sale across Europe before the end of the year. Check out our full coverage of the 2018 Paris Motor Show.